Address: PRICE RIDUCED! Beautiful property with 7 apartments! 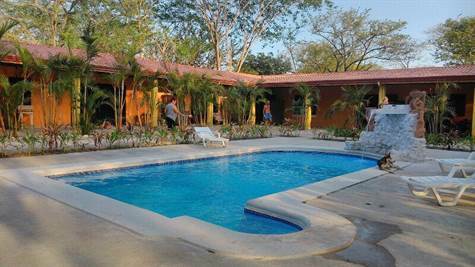 Located just 10 minutes from Playa Tamarindo is this beautiful property with 7 apartments now for sale at a NEW RIDUCED PRICE! FROM 575.000$ IT'S NOW AT 475.000!!!!!!!!! The apartments are each rented to stable long term renters and one is owner occupied. Steady monthly income, and low operating costs make this a great investment. The gated entrance is inside a beautiful neighborhood surrounded by nature with mature fruit trees. The property has a main electricity meter at its entrance. It’s totally built with concrete blocks and it has aluminum windows and doors. On the property there’s also a private well, and two septic tanks. Each of the 7 apartments has vaulted ceilings and are well appointed furniture and appliances. Four of the apartments have one bedroom, while the other three have 2 bedrooms. Each apartment comes with its own electricity meter, and it comes with private kitchen and bathroom. The apartments share a large pool, common hang out area and a laundry room. It has a big parking lot where at least 10 cars can be parked.